EasyFind 4 Way Key Tracker Easyfind technology sends a radio signal through walls and floors to activate an alarm on a key chain or other item, locating lost items up to 25 metres away. Press one of the colour coded pager buttons on the wireless remote and the corresponding key ring or receiver answers with an alarm. 2 key chain and 2 stick on locators are supplied in the pack. • Find lost keys and other important items quickly. • Compact transmitter activates the alarm on up to four lost items. 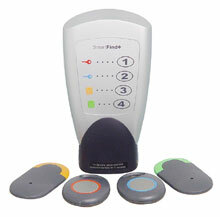 • Two colour coded key rings and two slim, colour coded receivers work with corresponding buttons on the wireless remote. • Loud alarm helps you find keys and other important items quickly. • Wireless remote uses 3 AAA batteries (not included); key ring receivers use button cell batteries (included). EasyFind Key Tracker Easyfind technology sends a radio signal through walls and floors to activate an alarm on the key chain, locating lost keys up to 25 metres away. The handy sized receiver unit can be connected directly to any key chain quickly and easily. • Transmitter activates a loud alarm on key chain. • Unique digital signature so you can use multiple devices without interference. • Discreet and attractive design.